Quite a few months ago now I purchased a tuff tray so that Blake and I can have lots of fun at home doing sensory/messy play. This will be the second time I've used it for that though as I have also been using it for letting him play with his Mega Bloks in. In my last post I mentioned that I have been reviewing Twinkl, which is a learning resource site for teachers, childminders and parents. 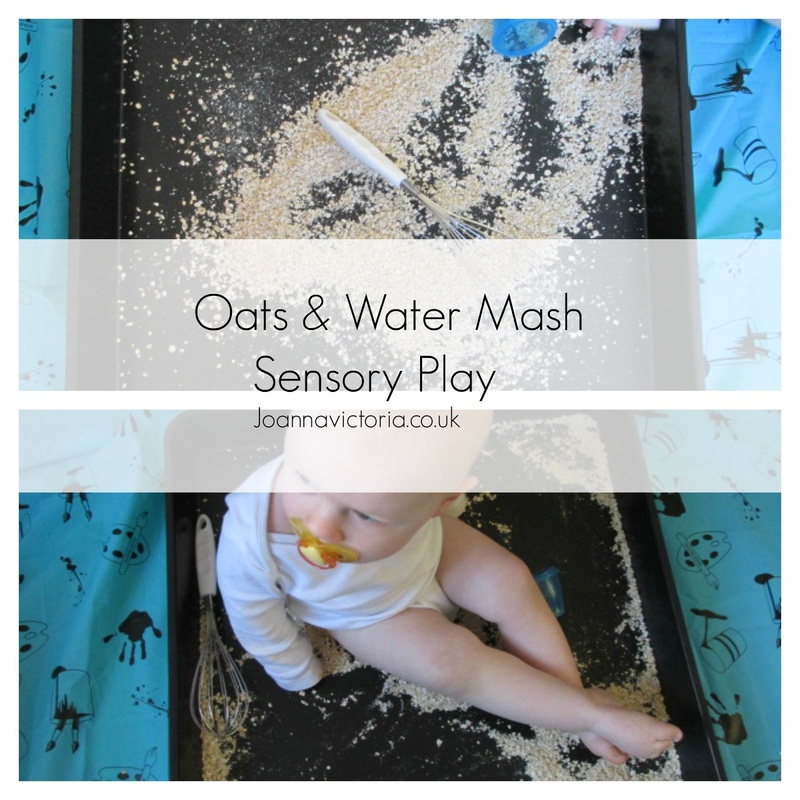 One of the sections I'm loving in the birth to twos resource pack is the sensory activities to aid learning. I chose to begin by doing one that was only slightly messy so that Blake can get used to doing this kind of thing. The Oats and Water Sensory Mash looked like a fab one to try out. I like that it's edible as at this age children love to put everything in their mouth. It's also very simple to do too. To begin with I let Blake play with the oats on just its own with the utensils. I was very proud of him for touching it on his own as usually he doesn't like to touch stuff like this especially as he hates porridge. As you can see below he liked spreading it out in the tuff tray with his hands. I then gradually added more water letting him explore each time I added more. I did have to encourage him once the oats were wet to actually touch them, but after awhile he was fine and he started to copy me using the whisk and playing with the gooey mixture. I added the cinnamon and encouraged him to mix it into the oats which he loved doing. I love how simple it is to do too although I'm glad that Stuart was around to help with bath time afterwards. I'm looking forward to doing more of the activities with Blake that are in the pack and also coming up with my own ideas too. Does your little one love messy/sensory play? What a lovely and simple idea! What a lovely sensory activity! Little man loves messy play now, but he didn't use to like it so much when he was younger. Aww how adorable! My little boy is also called Blake! He's 6 now but still loves sensory play - one of our first goes when he was a baby was with jelly and he loved it! If it keeps them occupied and and busy for a while, then looks like fun. My wife was an early years teacher and she says this is something she used to do with my step-daughter. It worked for her, so I guess it can work for other toddlers too. Great idea for sensory play!